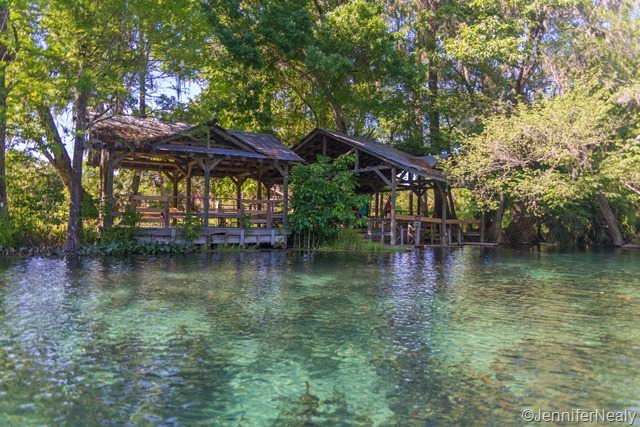 Next up on agenda was a 3-night stay at Silver Springs State Park in Ocala. 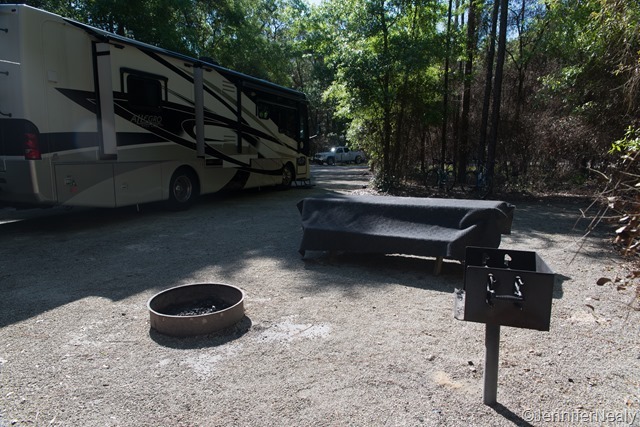 We didn’t know a whole lot about this park – we just picked it because it was on our route, and a quick glance of RV Park Reviews showed us that it had high ratings. But we quickly realized what a fantastic place it is and it’s somewhere we’ll definitely return to again. For one thing, the spaces are HUGE – I think the biggest sites we’ve ever stayed in. We had an interior pull through site (#8), which was one of the largest sites, but the exterior pull-throughs and back-in sites were very large too. 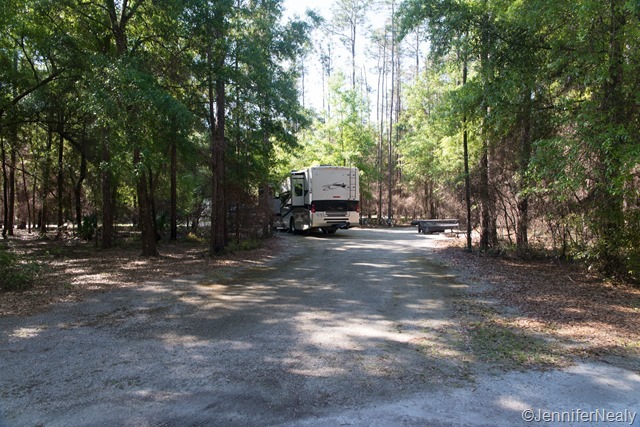 I walked our site from end to end and think it was about 90 feet long – I think we could have fit 3 of our RVs in there! All sites are water/electric only (50 amp), have large patio areas, and good separation from your neighbor. It’s a really nice park. 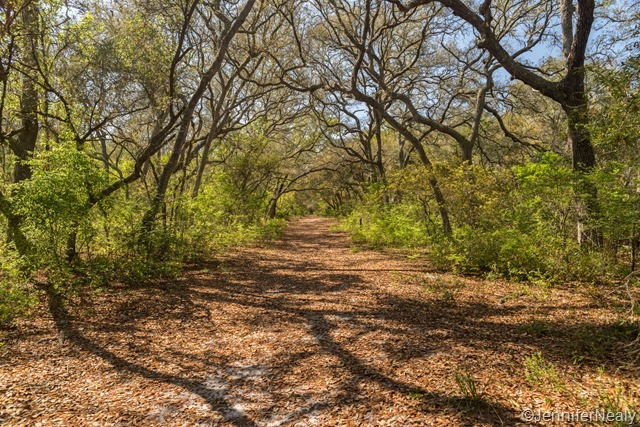 The other really nice thing about this park was the many trails available to hike. There are were about 7 of them, but we only had time for 2 – the River Trail and the Swamp Trail. Both were flat, well-marked and nicely maintained. 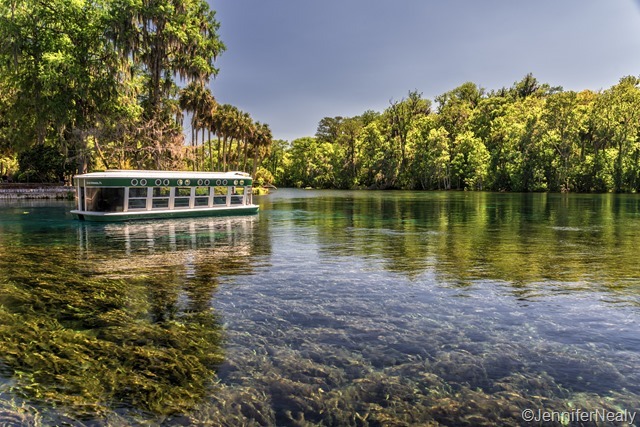 Silver Springs State Park is famous for the glass bottom boat rides which have been in operation since the 70s. Both Deas and I rode these boats as children, so we thought it would be fun to do again. We bought tickets for the 90-minute tour and had about an hour to kill so we just strolled around the park for a little while. 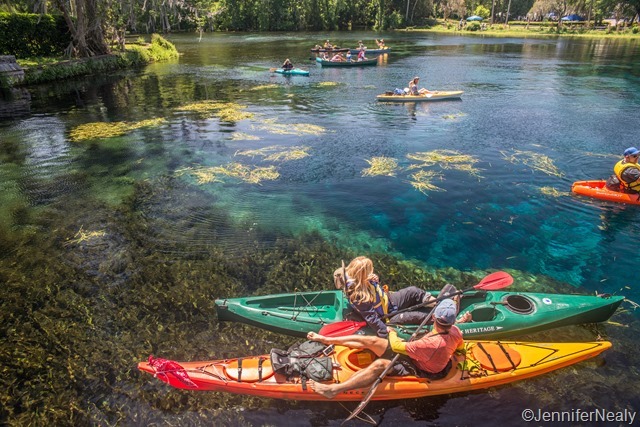 The water is unbelievably clear, and in addition to the glass bottom boats we saw lots of kayaks and pontoon boats as well. Finally it was time for our boat ride. It’s funny how doing something that you did as a kid can actually make you feel like a kid again! I’m not going to lie – I was pretty giddy as we were getting on the boat. It really brought back a lot of memories of doing this with my family. 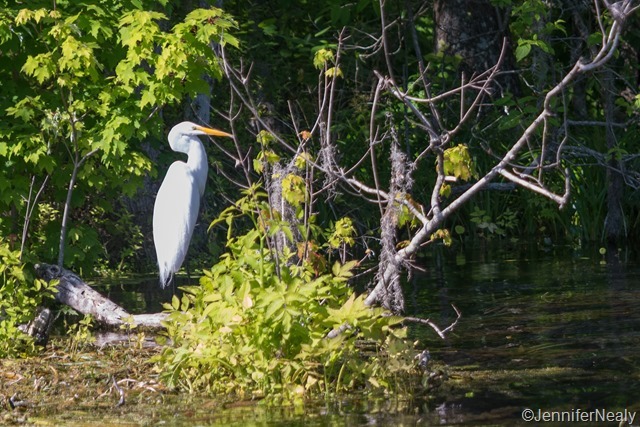 Our boat captain promised us that we would see lots of wildlife – and he was right! We saw lots of fish, birds, turtles, and even – monkeys! 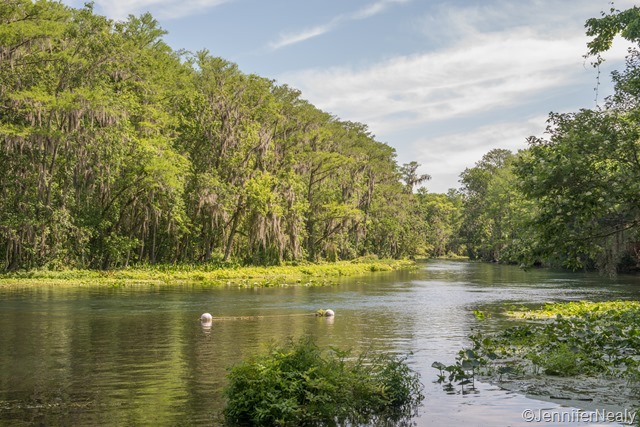 Back in the 1930s, when the area was an amusement park and not a state park, a concessionaire named Colonel Tooney put a bunch of wild rhesus monkeys on one of the islands on the river. He wanted them there as an attraction for the Jungle Cruise ride he operated. Unbeknownst to him, rhesus monkeys are excellent swimmers and quickly escaped the island. They’ve made themselves right at home over the years. 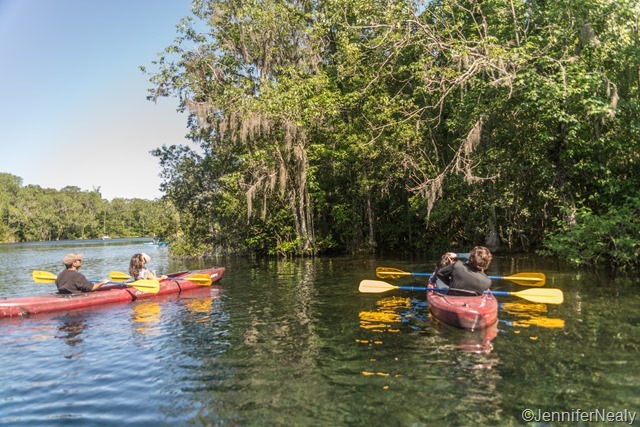 I didn’t have a zoom lens with me on this trip, but if you look at the picture of the girl in the yellow kayak, you can see a monkey in the tree right above her head. Much to my dismay, we also saw a few alligators. 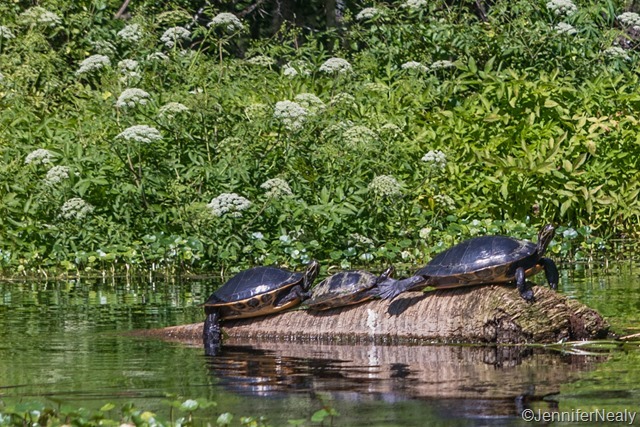 Growing up in Louisiana, I went on a few school field trips that involved canoe trips through the swamp. 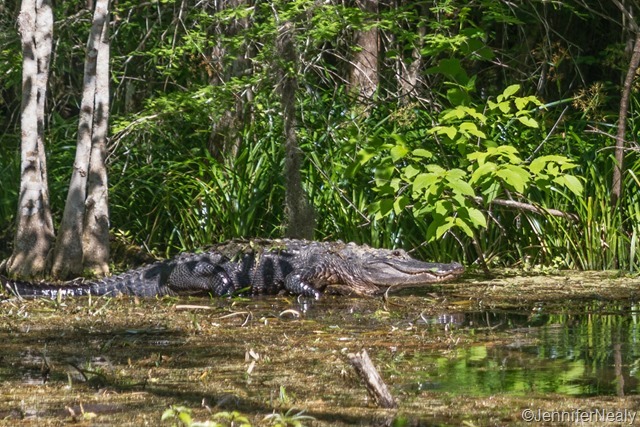 We almost always saw alligators, and they always terrified me. Once one of my friends was walking in knee deep water next to a canoe when he suddenly stepped into a hole or something, and disappeared underwater for a second or two. I was convinced he had been grabbed by an alligator and was nearly catatonic with fear. He was fine, but to this day I have occasional nightmares about alligators! So even though I was glad to be safely in the boat, I still could have done without seeing these two horrifying beasts. Especially that guy on the right – I still shudder even time I look at that picture! 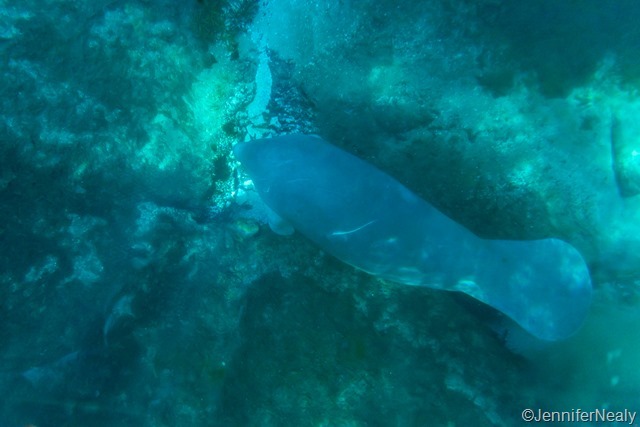 The highlight of the trip for me was seeing two manatees, one of which passed right under out boat. It was a real treat to see these gentle animals up close. 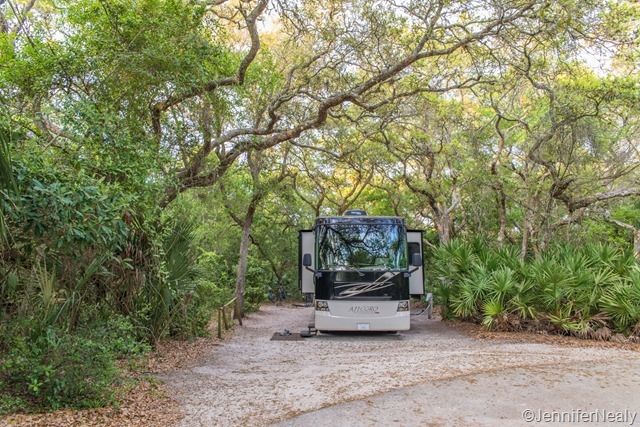 After this stay, we headed to St Augustine and Anastasia State Park for another 3 night stay. 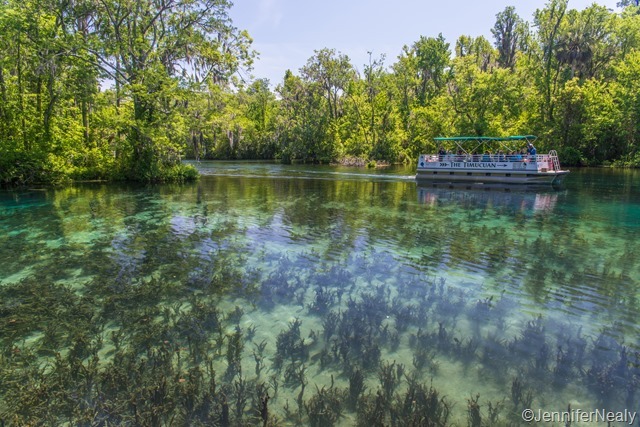 We had another great site – a little smaller than Silver Springs, but very private. Funny enough I realized that we were staying in the exact same spot that our friends Tim & Amanda stayed in just a few weeks prior! Our first day at the park, we did absolutely nothing. And it was great! Deas went on a long bike ride, and I sat on the beach for a few hours. And that was about it. The next day we took the dogs and walked around the historic part of town, but there was so much traffic and so many people, I didn’t get any pictures as I was too busy wrangling the dogs. It’s a beautiful, historic city – but not the best for trying to walk dogs. 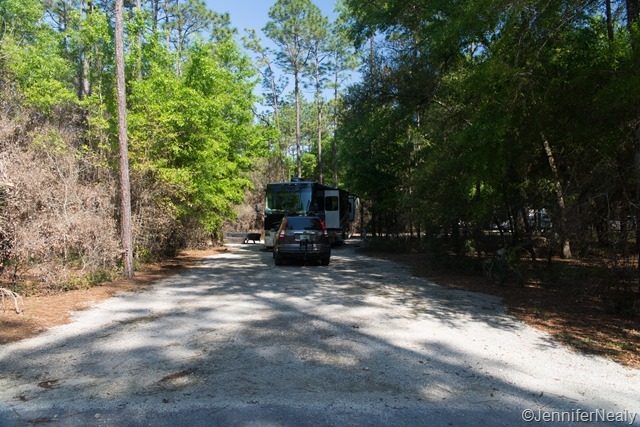 Later that day we met up with Christian and Alayne, who full-time RVed for two years but recently sold their RV and settled down in St. Augustine. We spent some more time walking around the city with them, had a nice dinner, and lots of fun sharing stories of life on the road. But alas, I again neglected to take any pictures. 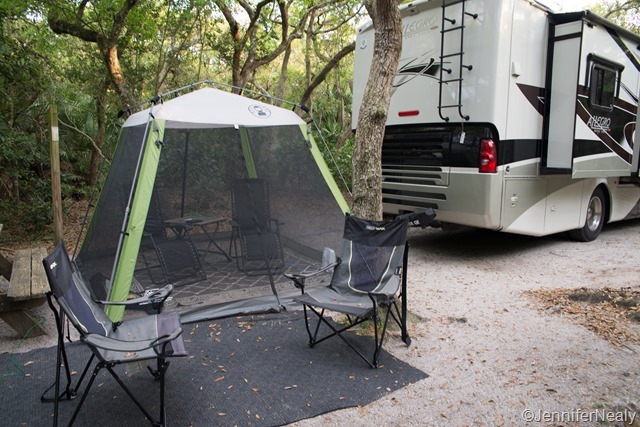 We got a new item for the RV – a screened canopy. I am one of those people that bugs love to munch on, and Deas got tired of hearing me complain about not wanting to go outside when it’s buggy. So we did a little research and decided on this Coleman canopy. We set up for the first time in Anastasia and so far we love it! And that wrapped up our stay in Florida….or at least so we thought. Next stop – the Georgia coast. 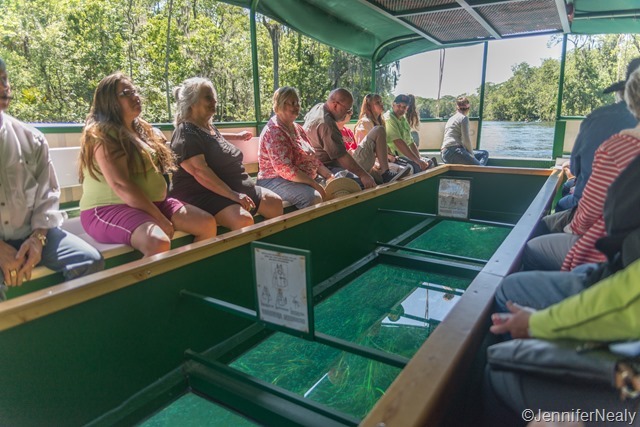 Love the glass bottomed boat tour! 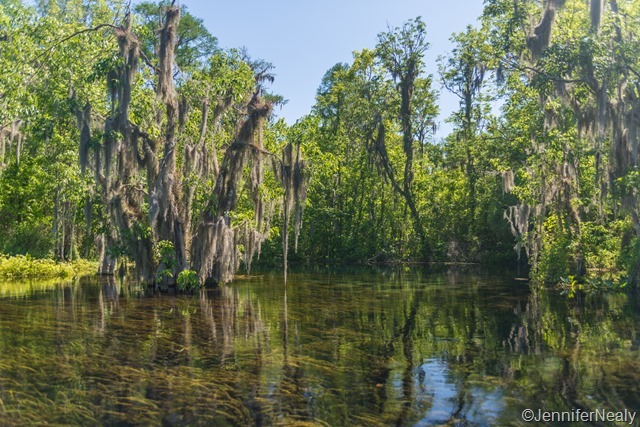 We recently did one of those in TX but did not have all the exotic wildlife you had in FL! It was actually really fun! Except for the alligators – still not over that part. I think we can easily fit all 4 of us! 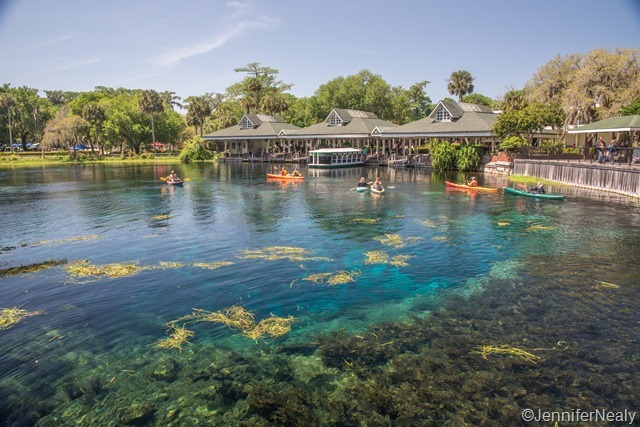 St Augustine was really nice park…but Silver Springs is hard to beat! How nice for you to live so close to it! Christmas in St Augustine sounds beautiful! Both parks are definitely going on our list of favorites. Cheers to you two also! Wow, what a great park! We will definitely put it on the list to visit! It’s a really great park – we’re hoping to return ourselves one day. Of course right now I’m super jealous of where you are – Hwy 395 is amazing and we can’t wait to go back there too! Highway 395 has been great. We just left and find ourselves in Ashland, OR. The drive from Reno to Ashland was one of the best we’ve been on…with Mt Shasta capping it off. That almost looks like the same spot we saw the alligator, maybe he just hangs out in that one spot. It’s a good thing you weren’t in a canoe with Brandon, he got me WAAAY too close to that guy. We didn’t stay at the park, but we’ll have to check it out next time. 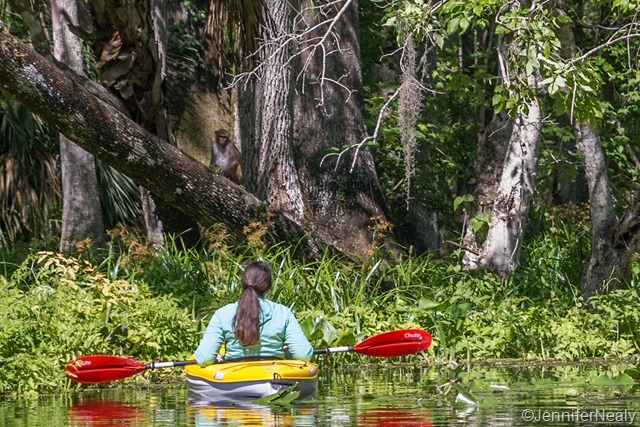 I would have had to push Brandon out of the canoe to fend for himself…LOL. 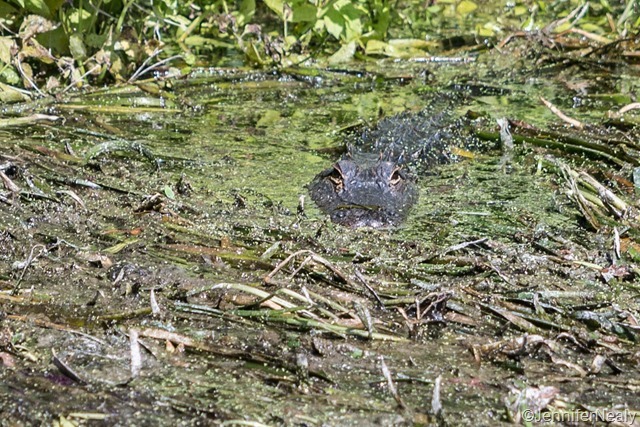 I saw the alligator on your video going crazy – I almost fainted. Horror. We’ll make sure to be more sensitive next time. LOL.